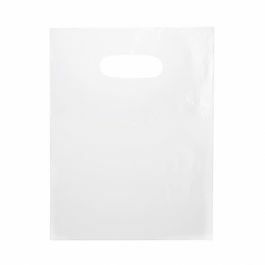 9" x 12" Clear Retail Handle Bags are great shopping bags for smaller items including books, boutique items and more. These bags comply with single-use bag ban laws, feature die cut handles, and are made of recyclable material. Meets NFL stadium security requirements. 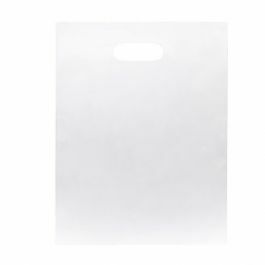 This 9" x 12" clear reusable shopping bag is a great option for stores when selling in the retail environment. These bags are made of recycled material and will meet single-use bag ban laws. 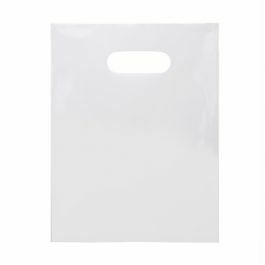 Clear bags show off your product and feature die cut handles that make these retail shopping bags easy to carry. For the avid sports fan, this bag meets NFL Stadium Security requirements. Outer Dimensions: 9" x 12"
Inner Dimensions: 9" x 9 1/4"
Custom size and print options available for reusable merchandise bags. 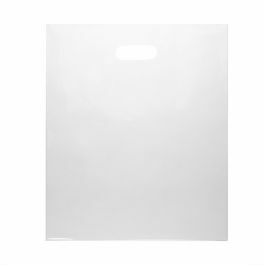 Visit our custom page to request a quote. Inner dimension length is measured to the bottom of the die cut handle.